I am super excited to be part of the talented makers in Katarina Roccella's blog tour. Thank you, Nina for letting me participate in this wonderful blog tour. Avant Garde fabric is just mind blowing. When I first saw the pics at Art Gallery website, I was totally in love. When I recieved the fabrics they looked awesome in person and then finally when I started making my quilts. I am truly amazing to see how versatile Avant Garde fabrics are. The arrows in the blocks were made from same two fabrics, but the the look is totally different. First I want to wish you all a very Happy and Joyful 2016. 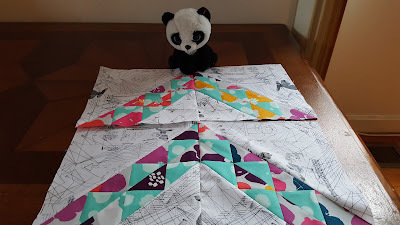 I am hoping and I would be quilting/sewing more this year! I am super excited to be part of Avant Garde Fabrics Blog tour. Avant Garde fabrics are designed by the wonderful Katarina Roccella and she out does herself with every line that comes out . They are so modern and fun fabrics <3. Here is the complete list of wonderful creators in the blog tour. Katarina is having 2 giveaways please be sure to check out her post. Link above in the introduction.